How are sounds produced on a shofar? How do a shofar’s length and shape affect its sound? And can it be played like other wind instruments? One of the most ancient musical instruments, the shofar is mentioned several times in the bible. In the Book of Joshua (Chapter 6), it was part of a battle plan to capture the city of Jericho: As Joshua and his army were about to conquer the city of Jericho, they blew the shofar to miraculously topple the city walls. A more conventional use is described in the Book of Judges (Chapter 7), when Gideon and his 300 warriors sounded the shofar in order to frighten the army of Midian who outnumbered them. 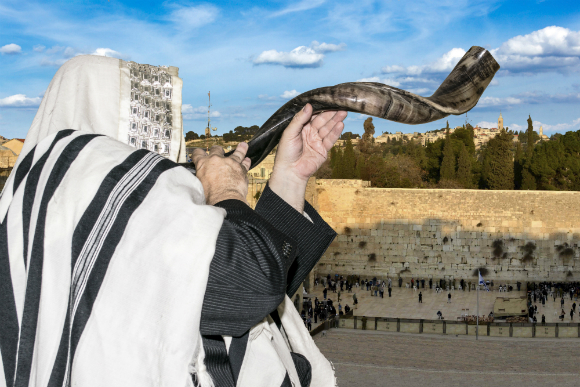 Today, the most common use of the shofar is in synagogue services, mainly on Rosh Hashanah (the Jewish New Year) and to mark the end of Yom Kippur (the Day of Atonement). Blowing the shofar is no easy task. Many who attempt it will simply fail at first, and even the most experienced shofar blowers may gradually go off-key after a long day at the synagogue on Rosh Hashana. What, then, is the secret to blowing the shofar? How can one produce an actual sound from of it, and what determines the pitch of the tone? The key to answering these – and many other – questions lies in the physics of the shofar. The most common shofar is made from a ram’s horn (in fact, the shofar is sometimes referred to as a “ram’s horn”). The horn’s wide base surrounds a core bone, which connects it to the ram’s head. Once the animal is dead, the horn is separated from the bone, resulting in a horn that is hollow in its wide part, but sealed at its narrow edge. Heat is applied to enable straightening part of the horn, then it is polished on the outside and an air-passage hole is drilled in the narrow part – making it possible to produce a sound from the shofar, similarly to a trumpet, a trombone, or a didgeridoo. Another type of popular horn is the long spiral shofar used by Yemenite Jews, which comes from the greater kudu antelope (Tragelaphus strepsiceros), which are common in some regions in Africa. Since the shofar is actually a wind instrument, to understand its physics, we must first turn to the physics of blowing wind instruments and musical instruments in general. Let us start the explanation with the guitar. Strumming a guitar string causes the string to vibrate over the sound box and produces a sound that depends mainly on the string’s length – the shorter it is, the higher the pitch. That is why when you press a finger against a specific point or fret on the guitar's neck – in effect, shortening the string – you get a higher pitch. When the string vibrates, it forms a standing wave, i.e., a wave that does not move in space since it is fixed on both ends. In a guitar, the wavelength is the length of the string. The longer the string, or wavelength, the longer it takes to complete a full period. The frequency, often measured in Hertz units (Hz), refers to the number of periods the wave completes in one second. A “long” wave completes less periods per second, therefore its frequency is lower, and it has a lower pitch. Likewise, standing waves are also formed in wind instruments, but rather than by vibrating a string, waves are formed by vibrating a column of air inside the instrument. In some wind instruments, like in the clarinet and saxophone, this is achieved by vibrating a reed on the mouthpiece, and in others, the players vibrate the air using their lips, like on the trumpet, the trombone – and the shofar. The sound produced by a wind instrument depends largely on the length of its tube. Like in the guitar string: The longer the wavelength of the standing wave, the lower the frequency – and the lower sound produced. This is why when clarinetists cover the holes along the body of the instrument with their fingers, they effectively increase the length of the tube and produce lower-frequency sounds. But unlike other wind instruments, the shofar has a fixed length. Therefore, from one specific shofar a player can typically produce one sound (known as the resonance frequency), which depends on the horn’s length – the longer it is, the lower the sound produced by it. This not only explains why the long Yemenite shofar will usually produce lower sounds than a short shofar, but also why it is so difficult to actually produce a sound from a shofar: The players must use their lips in order to vibrate the air in the shofar exactly in the resonance frequency of the specific shofar. In addition to a shofar’s length, its angle of bending also affects its sound. As mentioned earlier, shofar manufacturers usually straighten the naturally bending narrow end of the horn. The precise degree of bending changes from one shofar to another, resulting in a unique sound in each shofar. Some Yemenite Jews blow a short shofar barely straightened during its manufacture (unlike the long kudu shofar). If we compare it to a similar-length, but straightened shofar, the Yemenite shofar will usually produce a lower pitch. In general, however, the effect of an instrument’s bending on its pitch is more complex, and in some cases may actually lead to the production of a higher pitch. Many shofarot are polished during production, and some are even silver-plated. By contrast, some congregations only blow a shofar that was not polished. Although polishing affects the appearance of the shofar, it does not have a direct effect on the sound produced by it. Moreover, researchers found that in woodwind instruments, the material does not have a direct effect on the sound of the instrument. Nonetheless, the material may have an indirect effect on the quality of the sound. For example, a manufacturer making a golden flute is likely to exercise greater care during production than when using a cheaper metal. Therefore, the physical shape of the instrument will be much more precise, and this may improve the quality of the sound. By the same token, an instrument’s material may affect the player’s mood, which in turn affects the quality of the music. Although the player can largely produce a single sound (i.e., a wave with one frequency) from a given shofar, depending mainly on its length – experienced blowers can control the frequency in which they vibrate their lips, and produce one or two more sounds from the same instrument. How does this work? Returning to the guitar string for a moment, consider how a wave is produced from a given string in full length, but pressing on the string in the middle produces a wave with half the length and a doubled frequency. Similarly, one can vibrate the air in the shofar at the resonance frequency of the shofar, but also at a higher frequency – producing a different sound. When Sofer “plays with his fingers,” he effectively changes the shape of the shofar’s opening. This has a similar effect to the bell shape at the end of a trumpet, which causes low pitch sounds with long wavelengths to sound higher. Interestingly, Sofer notes that he cannot play music with most of the shofarot in the market today, since their mouthpiece is too narrow. For him, the ideal shofar is a short Moroccan shofar with a wide mouthpiece. For historical reasons, related to the fact that during the Spanish Inquisition Jews hid the shofar in their clothing, the Moroccan shofar is straighter than the Ashkenazi shofar. The straight shape of the Moroccan shofar enables Sofer to better control the sounds he makes with it. Using his technique, Sofar plays, among others, several Hanukkah songs and the songs “Avinu Malkeinu” and “Jerusalem of Gold”. In order to blow the shofar in Rosh Hashana, one has to produce only one sound. But the same simple sound is truncated into different lengths, producing the three different “calls” used in Rosh Hashana: Tekiah – a long, continuous sound; Shevarim (parts) – a Tekiah broken into three parts; Teruah – a Tekiah broken into nine parts. Thus different truncations of the shofar’s sound produce calls that are supposed to awaken the hearts with the opening of the new year.